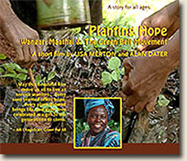 Appropriate for all ages, this inspiring seven-minute film focuses on Wangari and the tree-planting women of the Green Belt Movement. This is a great complement to your tree-planting activities and classroom curricula. Please opt in below if you want the printed ‘Taking Root Action Guide’ to be included with your order: $10.00 plus $6.00 shipping and handling. choose… Yes, Please send a copy. No, Thank You. This short film is currently shipped by Marlboro Productions to all customers for home or educational / organizational use. We usually ship within five business days. If you are interested in more than 20 copies of this DVD, please contact Marlboro Productions directly: takingrootfilm@gmail.com or 802-257-0743 (M-F; 9am to 4pm EST).